As I have written about in the past, I have a Ken Onion Worksharp (KOW) knife sharpener. Folks, I have used the heck out of that little thing and it is still cranking. For example, I used it one time to put the edges on five khukuris from scratch. They were antiques and I used my belt sander to remove the beat up edges and then the little KOW to profile and put the final edges on them. I can’t begin to guess how many khukuris, folders and fixed blade knives have been sharpened on this unit. At any rate, the one thing about the KOW is the cost and selection of the little 3/4″ wide x 12″ belts that it uses. Worksharp does sell kits with belts in them but its pricey. Happily, as the popularity of the KOW has increased, a number of makers have appeared. I’ve had very good luck with Econaway Abrasives and Red Label Abrasives to name two of them. What makes a belt good? I really look at two things – does the belt stay together and does the grit stay on or seem to flake off. I have no means of knowing whether a given declared grit is what I actually get – for example, the vendor says it’s 400 grit but is it really? All I can do is go by feel. I added a new step in my sharpening – I added a leather belt this year so I could use rouge on the belt for a grit of close to 10,000 for the final edge. I opted for a belt from Pro Sharpening Supplies. It comes with a small packet of white rouge polishing compound. Okay, I needed to sharpen my three favorite assisted opening “flipper” pocket knives. My #1 favorite is my 3.5″ Hogue X5. The other two tie for second place at this point – my ZT 350 and my Kershaw Knock Out. If I had thought about it, I would have put them in order of being my favorite. Purely by coincidence they are in order of age – the Knockout I bought near Christmas 2018, the Hogue was Father’s Day 2018 and the ZT 350 was purchased in 2015. Guys, I love that Wharncliffe blade profile on the Hogue. You can use it to scrape stuff as you have a flat edge. 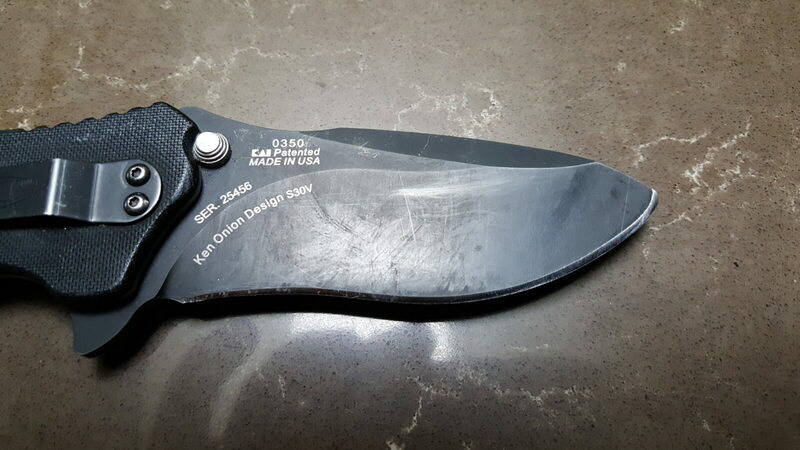 It had been ages since the ZT350 was properly sharpened, the Hogue needed a touchup and my new Kershaw Knockout did not have as fine of an edge on it as I wanted. 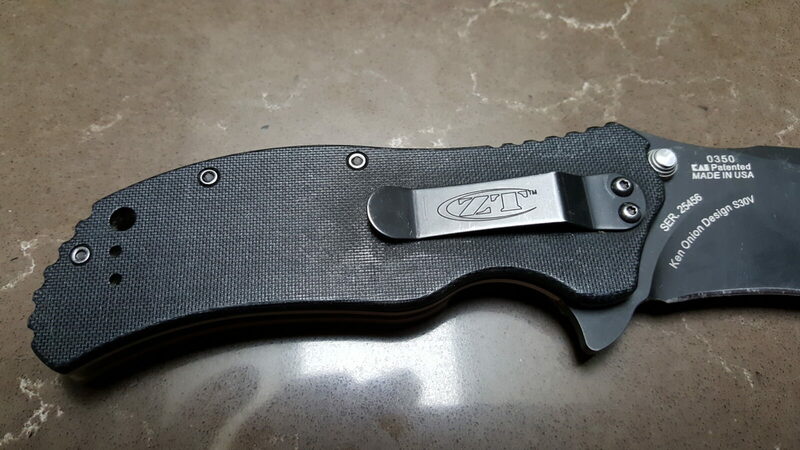 The ZT was part of what motivated me to buy the KOW years ago – The ZT uses S30V steel which is very hard and takes forever to sharpen by hand. I had been using a Spyderco Sharpmaker to that point and decided it was time to buy a better sharpener. The KOW has a wider 3/4″ belt and a bigger motor than it’s predecessor, the basic Worksharp unit. I’ve never regretted the purchase. The KOW is adjustable so I use this brass guage made by Richard Kell in England to determine what to set the KOW at. The blades were 15 degrees or less with the Hogue pretty much being right at 15. The other two, I’m not sure. They were more accute than the gauge supported. A Richard Kell blade angle gauge. I bet everyone has their secret formulas for sharpening blades and odds are they all work. Since these were all touchups, I started with a 320 grit belt. See, I don’t want to take off any more than I have to so I’d rather start with as fine of a grit as possible. Okay, it through parts of loose leather everywhere when it first started just like when you start a new cloth wheel on a buffer. It did stop after a bit. By the way, safety note – you should always wear safety glasses and a dust mask regardless – this just reminds you of the need. The second comment is that it did not stay centered on the wheels of the KOW and traveled to the left when looking down from the top towards the front edge. It did not seem to harm anything but the whole point is that it really should have stayed centered on the wheels. No harm done and since I will not use it a ton, I am not going to worry about it. Photo of the belt up on the left edge of the front lower wheel. Note all the junk on the mat. Good reminder to wear eye protection and a dust mask *always*. Lesson learned for me, dial back the speed on the KOW from the get go when doing the leather belt. All three knives are wickedly sharp now. I’m very pleased with the results. Whenever I sharpen a flipper, I blow out the insides with compressed air and then lubricate them. My preferred lubricant is Teflon/PTFE. Because it dries after application, it does not attract and hold dirt. Thus, I applied it to all three knives like I normally do. It’s common for things to feel gritty until the fluid evaporates but the Hogue didn’t get better, it got worse. I’m not sure what Hogue uses to lube their knives but the solvent in the Dupont spray must have cleaned it off and the dry Teflon wasn’t enough. Conversely, the ZT 350 and Kershaw Compound worked great. It’s not unusual to see something work with one mechanism but not another so it was time for plan B. Okay, plan B. I started using Super Lube this year on firearms and really like it. Basically, Super Lube is a synthetic lubricant that includes tiny PTFE particles in it. So, I applied it with a pen dispenser and it works great. Way, way better. The knives are all very sharp and they are flipping smoothly. Time to keep using them 🙂 I hope you found this helpful. Without a doubt, Kershaw makes a ton of interesting knives. Many times they bring in design talent such as Rick Hinderer. I’ve been a fan of Rick’s work for years and own a number of his designs plus I had a huge surprise one year when I happened to meet him on a flight! He was wearing a Hinderer T-shirt and I couldn’t help but tell him while we were waiting to get off the plane that those were great knives. He turned and said “I’m glad to hear that – I’m Rick Hinderer.” We chatted for a bit as we walked through the terminal and he really struck me as a down-to-earth guy. At any rate, I was surfing and saw the Kershaw Cryo. It’s not a new design by any means – It got Best Buy in 2012 by Blade Magazine. For whatever reason though, it had never caught my eye until that point. Specifically, the 2.75″ model with a Titanium Carbo-Nitride coating did. I was looking for a small light knife and it was affordable enough to simply order one in and I am glad I did. 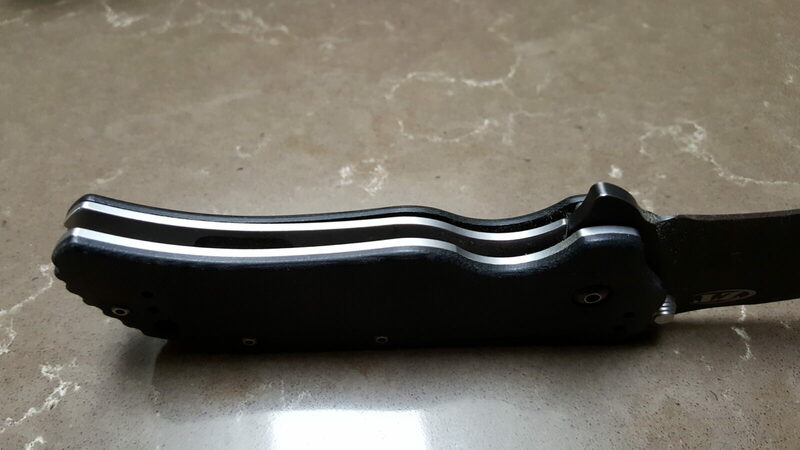 With the Titanium Carbo Nitride finish, the knife is a nice grey-ish color and the black hardware contrasts nicely. The clip can be moved around to suit the user. Boy does it look nice. Right out of the box I was stuck by it being a modern day gentleman’s pocket knife. It was small, light and had a quality look to it. Blade Material: 8Cr13MoV – a decent Chinese steel roughly the same as AUS-8. 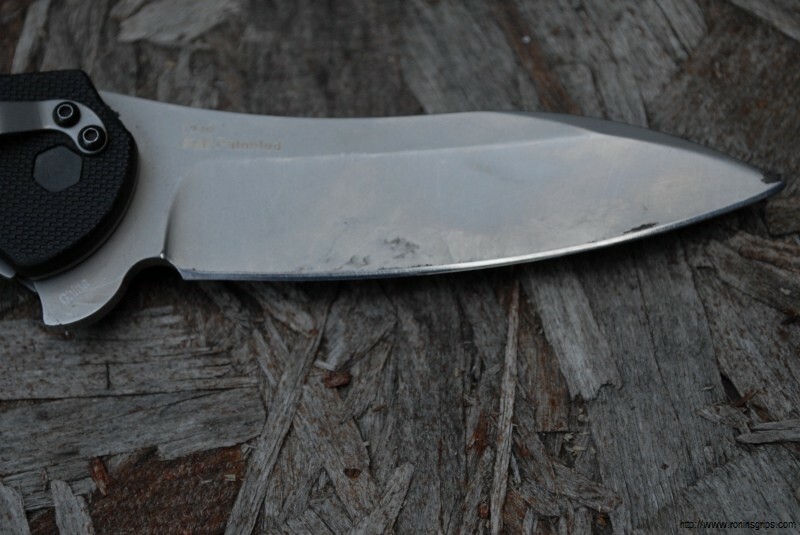 Kershaw blades make extensive use of it and do a good job of heat treating it to a hardness of 58-59 Rockwell. I really like it for those cases where you want a pocket knife just in case you need to do something light duty but don’t want it really weighing down your slacks or whatever. Honestly, Amazon has it for $21 with Prime – you just can’t go wrong at that price. I actually bought these knives, it’s not like someone asked me to do a review. In this case I bought both the Cryo and Cryo II because I couldn’t decide which I would like more and they are both very affordable. 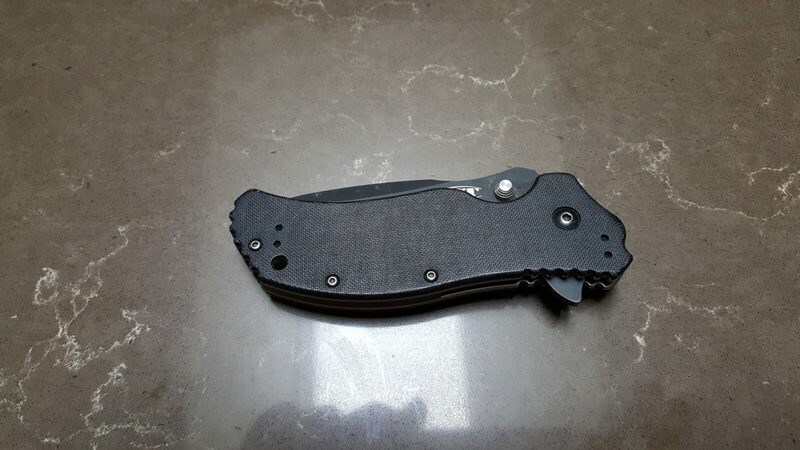 This is also a Hinderer design and is 20% larger than the original Cryo. The Black Wash finish mutes the shiny grey steel considerably without going completely black. Blade steel: 8Cr13MoV – Kershaw makes extensive use of this mid-range stanless steel and heat treats it to 58-59 Rockwell hardness. Yeah, I like this one also. I wind up leaving knives scattered all over so I bet there will be times I am using this one also. It definitely feels beefier than the Cryo but is still very easily carried. I figured this would be a great chance to let you visually compare the Cryo and Cryo II to one another as well as my Kershaw Knockout. In the photos below, I tried to be consistent – the Knockout is at the top, followed by the Cryo II with its Blackwashed finish and the Cryo with its Titanium Carbo-Nitride finish at the bottom. I didn’t review the Knockout in this post as I felt it really was for a different intended type of use. The Cryos are lighter and more elegant. I’m glad I have all three and have no reservations in recommending them at their respective price points. I’m pretty pragmatic when it comes to pocket knives. Looks matter but the knife must also be something I can use as a tool. For me, I am always having to cut down boxes, cut plastic, strip wires, and so forth and a knife may well get wet from rain, snow, or plumbing. Furthermore, I need something that I can readily carry in a pocket. Kershaw has made a knife I really like with their 1870OLBLK Knockout. Let me take a few minutes of your time to say why I am impressed. The first thing I noticed when the knife arrived was Kershaw’s proudly placing the USA label on the box. Many of Kershaw’s blades are made in China but the Knockout is made in the USA – Tualatin, Oregon, to be specific. The olive drab handle and blackwashed blade really make a good looking combination. You can see the holes for the pocket clip if you wanted it positioned up front on the nose. There’s a generous thumb stud and the Speedsafe flipper lever protrudes from the bottom. Here’s the reverse side with the clip plus use can clearly see the black colored sub-frame lock. The handle has three positions drilled and tapped so you can move the clip around. The stylized US flag is a nice touch just under the clip plus you can see “Made in the USA” on the blade through the sub-frame. The blade steel is 14C28N. I appreciate blade steels and this is a pretty decent middle-of-the road steel made by Sandvik. It can take a keen edge, is corrosion resistant and holds up pretty well. The blade is colored black using the DLC – Diamond Like Coating – process. Overall weight is 3.4 oz. It’s fairly thin and light. I wear XL-sized gloves and the knife fills my hand very nicely. The combination of a relatively tall blade and the weight of the handle gives it both a good heft and a balance that I like. It does not feel cheap by any means. The flipper mechanism is solid and does a good job. The sub-frame lock does its job firmly yet is also is easy to unlock. You can’t say this for all frame locks – some can be more cumbersome to move out of the way than others. By using the sub-frame they can get the right geometry and tension to do the job yet also be easy to move out of the way to unlock the blade. This cut out, or knock out, that they did in the frame to hold the riveted in sub-frame is actually where the knife gets its name. Look carefully at the handle and then look at your hand with the fingers bent just a tad. The handle’s curve and the bumps will conform to most hands very nicely. Your hand will index on the big finger groove they made for your index finger – no pun intended. In other words, your hand’s position will begin by putting your big first finger in that groove. Kershaw actually has a short overview video so you can see the blade at different angles. Now, so you have a comparison, here’s the Knockout next to my Hogue X5 with a 3.5″ Wharncliffe blade, which is my most frequently carried blade now. 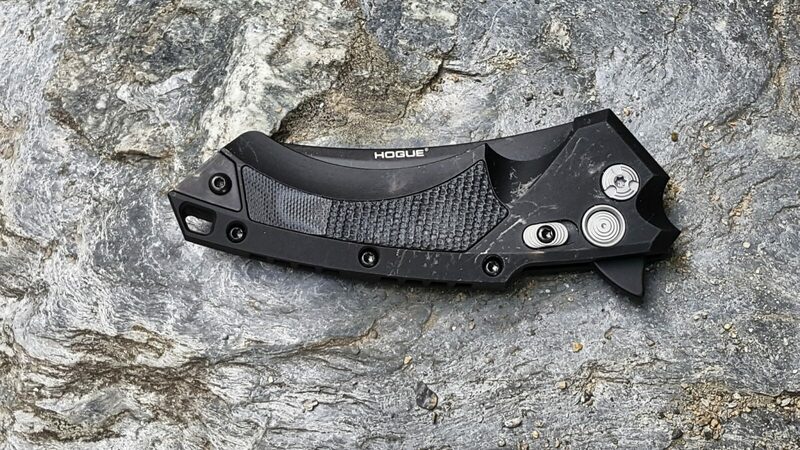 I’ve given up saying every day carry because I seem to be rotating through a few but more often than the others, it’s the Hogue. We’ll just have to see if Knockout dethrones the X5 over time. The Hogue X5 3.5″ Wharncliffe is striking to look at but let me tell you something really cool – the CPM154 steel is really excellent and the profile of the blade makes it excellent for scraping a surface with a relatively straight edge. It arrived quite sharp and I just did a few test cuts. At this point, I need to see how the Knockout holds up over time. As far as first impressions go, I really like it and will keep folks posted. I really like assisted opening folding knives. For example, I routinely carry either a Hogue X5 that my wife and kids bought me for Father’s Day or a ZT 350. I am working all the time and often find myself needing to cut something. In the old days, that meant I would have to fish out my pocket knife, open it with two hands and get back to work. Now, I find the knife, open and cut all with one hand – it’s way more fast and efficient. There’s one catch though – you’ll notice the action can get slower/less efficient with time whether it is spring assisted or not. There are two likely causes for this – grit/dirt/debris working into the action from your pocket and just plain use as well as a loss of lubrication. This is actually really easy to remedy. First, if a knife was oiled, I like to use brake cleaner to remove the oil or it will just attract more dust and debris in the future. Brake cleaner cuts oil and grease quickly and does not leave a residue. Now, be careful on real cheap knives. Some plastics do not like brake cleaner but you will not run into a problem with materials like metals, epoxy laminates such as G10, Micarta and so forth. The cheapest way for you to get brake cleaner is from any place that sells car parts – Auto Zone, Pep Boys, O’Reilly, etc. Second, I blow out the mechanism with compressed air. Since I have an air compressor, doing this at 60-90 PSI is really easy. If you don’t have a compressor, a can of Dust Off or something like that will also work. Third, I lubricate the blade mechanism with Dupont’s Teflon Dry Film aerosol. This stuff is just what the doctor ordered to lubricate a pocket knife. You see, oil causes dust, sand and other junk you do not want to get stuck in the action. In short, yes, oil helps the blade open and close easily but stuff will stick to it. Instead, use a dry lubricant. Dry lubricants leave some form of slippery substance behind that is not a liquid. In the case of the Dupont branded product I use, it leaves Teflon behind. So the Teflon is suspended in a liquid that then evaporates away and leaves just the Teflon. I spray it into the action, work the action to get it everywhere and evenly distribute it. I then use a cloth to wipe off the extra. The above three steps works great for me. The one caution I would give you is to make sure whatever dry lubricant you choose to use really does leave a dry residue. A while back I did some testing and found that the “3-in1” brand product does not leave a truly dry film behind for example. I do the above for all my flippers and find it really helps. I hope you find it useful as well. Work Sharp 3920 Ken Onion Stropping Belt Kit 1" x 18"
Got a Hogue X5 3.5″ Pocket Knife with a Wharncliffe Blade for Father’s Day!! Well, my wife sure surprised me this year — she bought me a Hogue X5 pocket knife (SKU 34569) at Smoky Mountain Knife Works when we stopped at the store on Father’s Day. I carried it every day until we returned home on Wednesday. For some reason I did not get more photos of the knife new out of the box. The photos I am showing are all after 2-3 days of being in my pocket with keys walking all over the place. I must say that I am disappointed that the finish on the frame scratched in a few places but this knife was always intended to be a working blade and not a shelf queen. Standing up to keys is the least of my worries really. 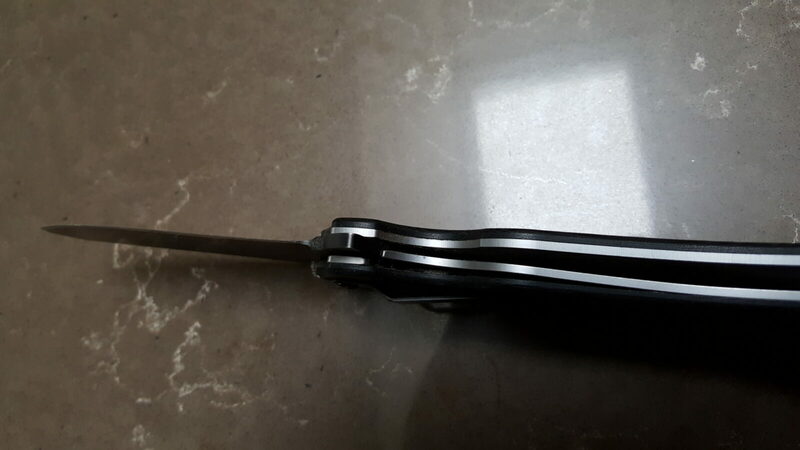 It is interesting to note that the top of the blade that was exposed to the keys also shows zero wear relative to the frame. We’ll see how the finish holds up over time. 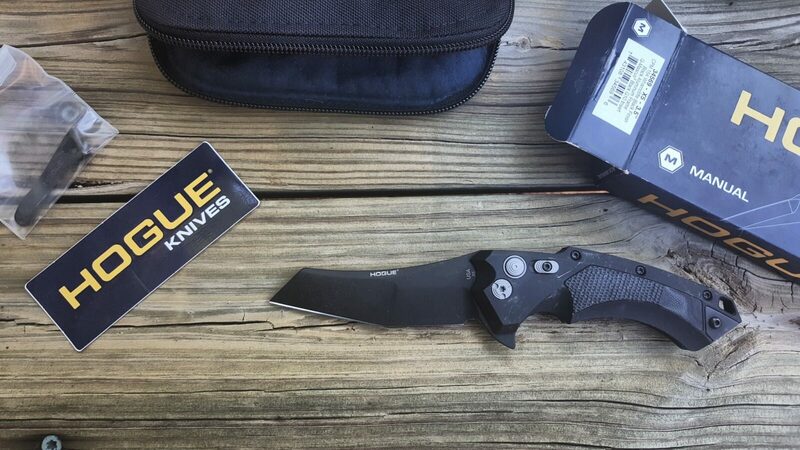 I’ve been a fan of Hogue knives for a while – especially after a good friend bought one of their fixed blade models. I had a chance to look it over carefully when it was brand new about three years ago and it was very well made. He took it to Alaska and California used it a ton camping and climbing. As for me, I’ve wanted a Hogue but the right opportunity never seemed to pop up until now. So this is a almost new out of the box review 🙂 Let me start by saying that the X5 family of blades are very well made. I was trying to decide on whether to get another Zero Tolerance (ZT), a Benchmade or the Hogue and finally settled on the Hogue that you see. The 3.5″ blade is 0.15″ thick and is made from CPM154. This is the CPM manufactured version of Crucible’s 154CM that folks into knives like – it’s relatively easy to sharpen, tough and corrosion resistant. In short, the business end of the knife is made of excellent steel that is 57-59 on the Rockwell scale hard. 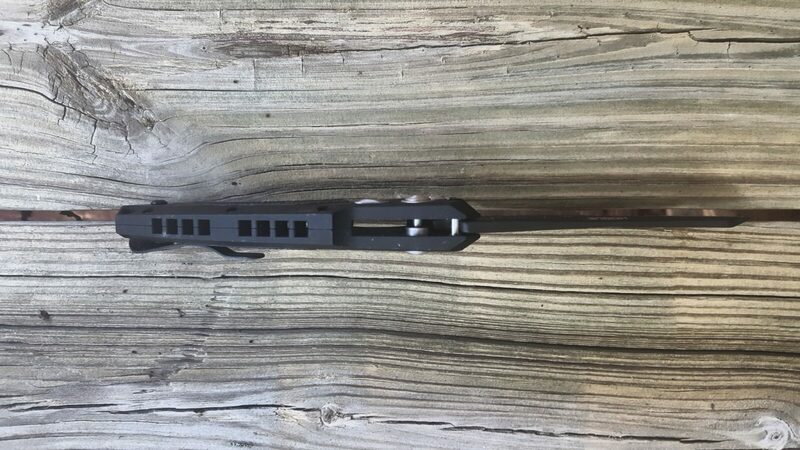 The blade was cryogenically treated and then finished in a black Cerakote. By the way cryo treatments are fascinating. Click here to read a great write up about them. The profile is a stunning looking wharncliffe style. Wharncliffe profiles have always caught my eye and there is a bit of history to them. The Viking Seax blades are the first knives I have seen with this profile that is the reverse of most knives. In terms of the name we often use today, the first Lord of Wharncliffe came up with the design in the 1800s and had Joseph Rodgers & Son him some pocket knives. The blade is a spring-assisted flipper and it opens very smoothly. You can see the round blade release button and a sliding lock behind it. When the lock is engaged, the button can’t be pushed and blade is securely locked open. I like spring-assisted blades by the way as I am always in some weird position trying to open boxes, working on machines, etc. where I can only get one hand free. The frame of the handle is aluminum with a black G-mascus G10 insert. When closed, the knife is 4.75″ overall yet weighs only 4.66 oz. I really liked the combination of size and light weight. Plus, the frame is remarkably thin so it fits in your pocket nicely and doesn’t feel like a boat anchor. Now this knife is pretty new to me right now. I haven’t cut anything yet but definitely will be as I have quite a list of stuff to get done and I’ll be cutting open boxes, plastic tubs, etc. 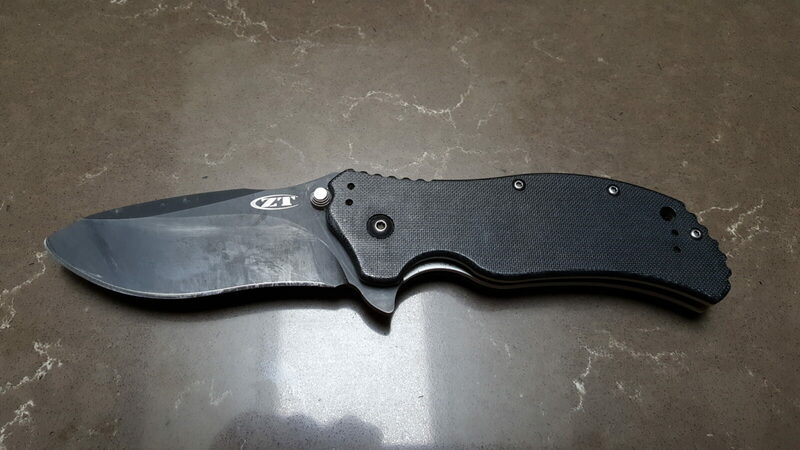 I’ll post updates plus I want to compare it to my ZT 350, my favorite EDC blade but I want more mileage on the X5 before I do that. 6/28/2018 Update: Used it to cut 4″ diameter corrugated drain tube and a bunch of boxes. It is very sharp – I didn’t touch the blade up. Still going strong. Like all flippers, when I got dirt in the action it wouldn’t flip until I blew it out. Last comment – it has a real nice feel when I am using it – not awkward at all. I wear XL sized gloves just for reference. 10/6/2018 Update: This blade rocks. It has really held an edge and the finish on the blade has held up remarkably well. Only the handle shows evidence of scuffing so far. 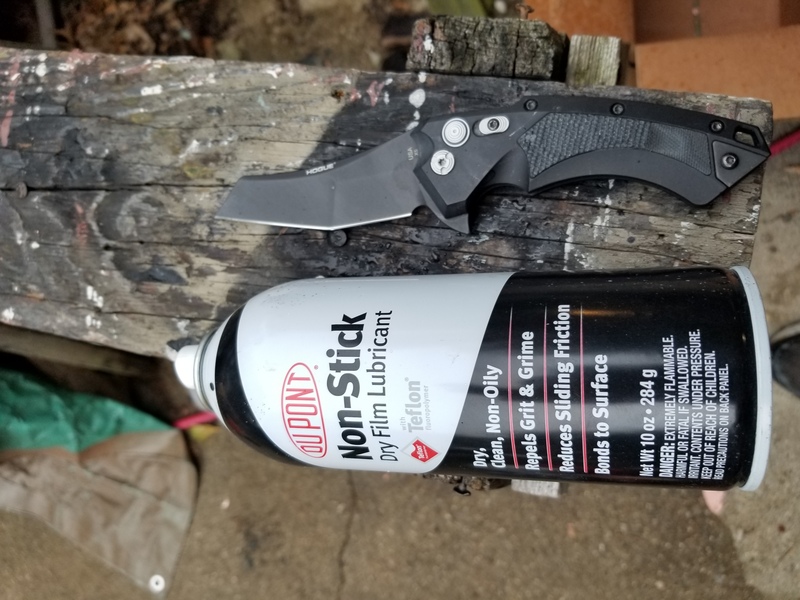 If you are interested in how I lubricate my flipper knives, please click here. A few guys asked for details about my every day carry (EDC) knife. It’s a basic Kershaw Compound but what makes it special is that my youngest daughter bought it for me as a birthday gift when we visited Smoky Mountain Knife Works a few years ago. It is trades off size and weight such that it fits great in my pocket. It uses their SpeedSafe assisted opening mechanism, which is fast, reliable and does not open in your pocket. 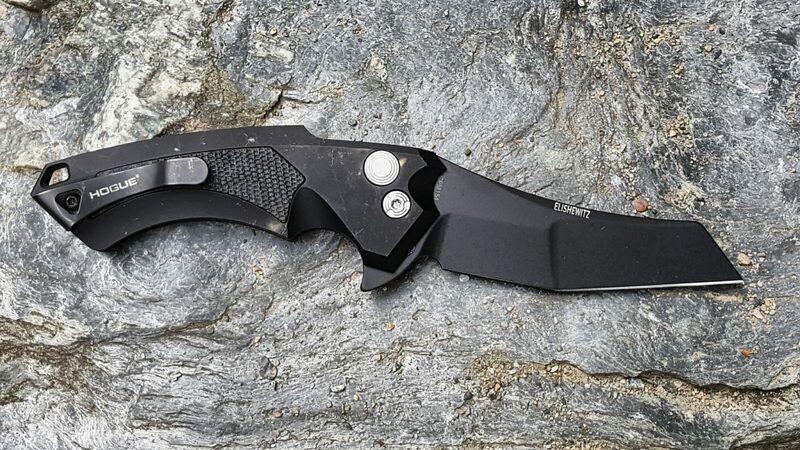 I had a Gerber FAST years ago that I eventually gave away because the stupid thing would open in my pocket all the time. 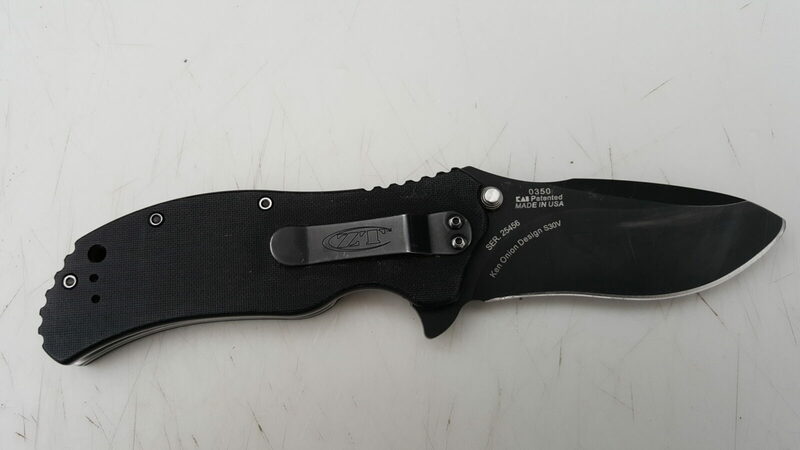 Kershaw’s design is simple and has never opened accidentally on me. I figure the pretty good edge retention, strength and corrosion resistance can be attributed to the 8CR13MOV alloy they used. With the heavy use I touch the blade’s edge up maybe weekly or every other week – it’s more “as needed” than scheduled depending on how much I have used it and how it feels while cutting. 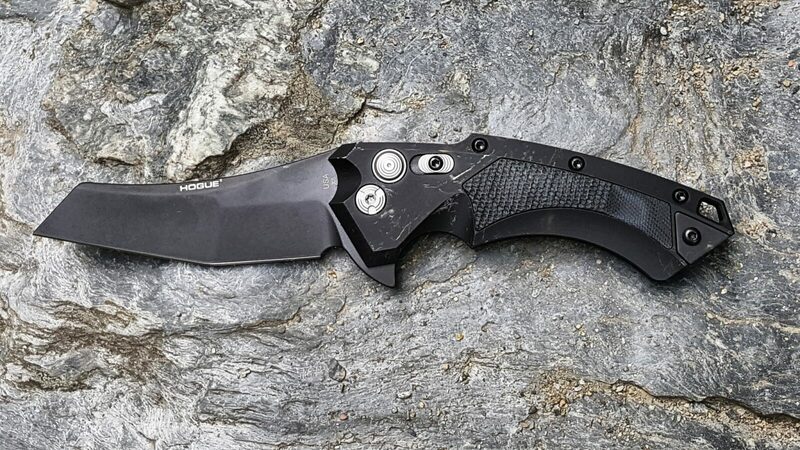 In general, Kershaw is my favorite folding knife maker and am also a fan of their high-end Zero Tolerance folders (the parent company, KAI, owns both groups). 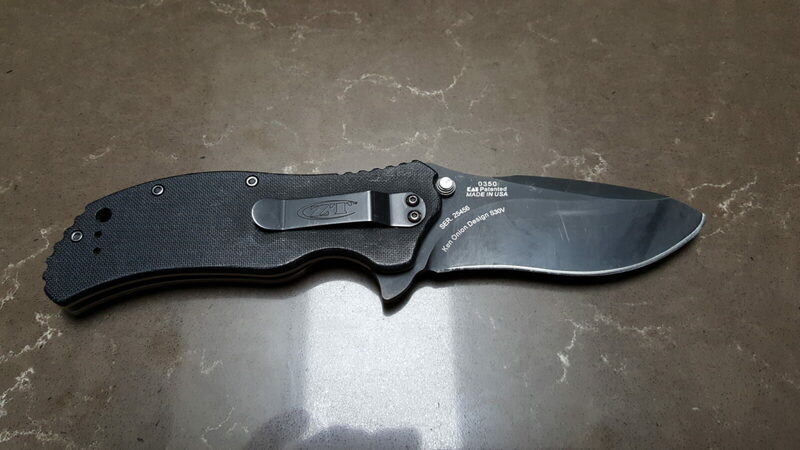 You get a great blade at a great price from either brand – Kershaw or ZT, and I definitely like my Compound – not to mention my little girl bought it for me! Post Edit: This was back in 2014. 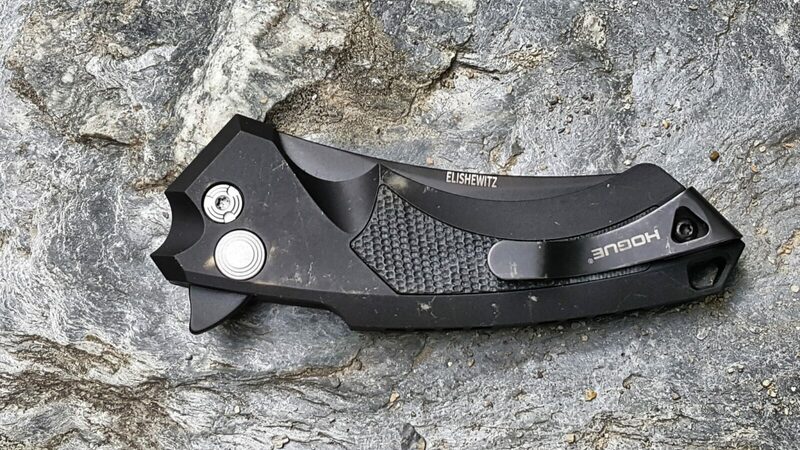 I really liked the Compound but use a ZT 350 now as it has much better edge retention but I did have to explain the change to my daughter 🙂 I’ll write about the ZT 350 at some point.